Wastewater treatment specialist, Lancy Technology – part of NHE – is enhancing its range of capabilities and services with the addition of wastewater evaporation systems from German manufacturer, H2O GmbH. Lancy Technology is now the exclusive UK and Ireland distributor for the full range of systems manufactured by H2O, providing a broader service to its customers and building on its well-established reputation in this sector. “Lancy Technology’s success is based on the provision of water recycling and effluent treatment services that centre on delivering proven, innovative equipment and leading expertise in the field,” says Keith Allen, Business Development Manager at the company. “The link now with H2O enhances this capability in a key area that impacts directly on efficiency and environmental performance across a wide range of machining and manufacturing sectors.” He points out that Lancy Technology is now able to supply the full range of H2O units, building on selected Vacudest evaporation systems which have featured in a number of tailored and stand-alone Lancy Technology installations already undertaken. The success of the Vacudest concept owes much to its modular design which enables it to be customised to meet specific installations needs. Some 95% energy recycling translates to excellent operational efficiency whilst the high evaporation rate associated with the equipment enhances its cost effectiveness. 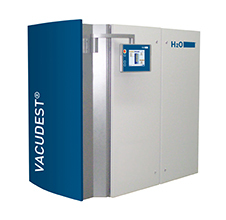 Factors such as a maintenance-friendly design and simple control systems, including internet connection for remote diagnostic purposes, are seen as further factors that help to produce the highest quality distillate from each Vacudest facility. Installations with annual capacities ranging from 180 cubic metres to 12,000 cubic metres can be accommodated across the range. These encompass pure water capacities of between 30 and 2,000 litres per hour, and wastewater equivalent of between 22 and 1,500 litres an hour – for operations based, typically, on 8,000 hours per year with a 5% average evaporation residue of the wastewater. “Significantly, the system can also enable treated water to be re-used in production, which builds on the economic benefits of the H2O designs and will be acknowledged across the processing sector,” continues Keith Allen. This forward-looking confidence is echoed by Jochen Freund, H2O Product & Business Development Manager. “Due to their expertise in industrial wastewater treatment technology and their excellent market position, NHE is the ideal partner to team up with,” he says.